In honor of July 4, we decided to whip up some cupcakes, as well as share some of our favorite links to recipes we liked for this holiday weekend. These red, white and blueberry cupcakes with rum icing can be modified to fit your time and taste. For the buttercream frosting we used imitation rum, but you can substitute imitation vanilla if the rum is too sweet. To decorate the cupcakes we used the Wilton 12-Piece Cupcake Decorating Set. But, if you need to save time, you can use a knife to frost them and put a layer of blueberries across them. Prepare the red velvet cupcakes as directed on the box, and let fully cool on a baking rack. While they are cooling take the softened butter and confectioners sugar and beat slowly using an electric mixer with the whisk attachment. Once it starts to combine, add the imitation rum (or vanilla) and the heavy cream. Increase the speed to at least medium and whip for several minutes until it becomes fluffy. If you are using the Wilton kit, use the star tip 22 and circle the top of the of the cupcake with the frosting, and top with a single blueberry in the center. 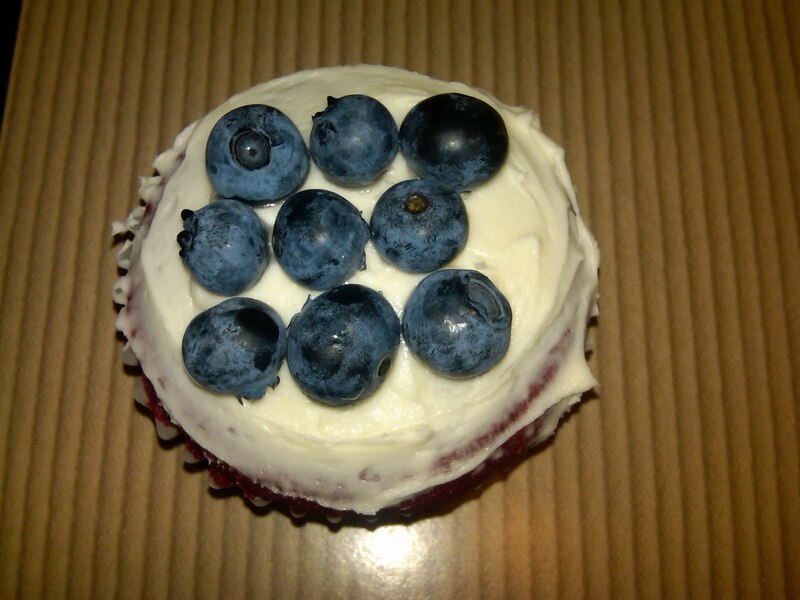 If you are using a knife to frost the cupcake, cover the cupcake completely and then put three rows of three blueberries on the top. If you are entertaining, and need to make more than one item, here are some fun recipes we came across and liked. *** BakedBree has a really awesome flag cake that looking from the outside you would never expect what is waiting for you when you bite into it. *** Taste of Home has a collection of their top 10 most patriotic dessert recipes. *** Baking Bites has a great recipe for red, white and blue chocolate dipped strawberries that look amazing! cute. I figured you would use real rum, but I guess this way kids can eat them too. Your cupcakes look delcious! Please link up and share your recipe with our readers. Thanks! These cupcakes look delcious! So happy to have stumbled upon your blog! This is perfect recipe for this week's Sharing Sundays, theme CUPCAKES!! Please come by and link up this recipe and any other cupcake recipes you would like. We will feature the top 5-6 viewed recipes next Sunday. The link is opened until Saturday evening.